When I read about the QuiltCon 2017 Charity Quilt Challenge, I was really excited. As an individual Modern Quilt Guild (MQG) member, I had the choice of forming a group or submitting my name to the MQG to be placed in a group. I reached out to the group of women whom I recently worked with on the personal V and Co Ombre mini quilt swap: Renee @Quilts of a Feather, Afton @Quilting Mod, and Sara @Blue Quail Studio. We had discussed potentially collaborating together on the Charity Quilt Challenge during QuiltCon, and they were as interested in the charity quilt challenge parameters as I was, so I crossed my fingers and asked the MQG if quilt guild members could join me in an individual group for the challenge. To our delight, we got the go ahead and we formed the Blue Moon Quilters. This year’s challenge requires participants to work collaboratively to create completed quilts using a predetermined color palette while crafting a design that plays with scale. I said I was excited, right? Well, I asked the group what kind of block or design they liked most. Renee and Sara were crushing (and rightfully so) on a quilt Afton had recently finished, Small Wonders Kaleidoscope. They were especially drawn to the curved effect that the very crisp, straight piecing was able to achieve, and both mentioned Storm at Sea as a favorite kind of block that played with that affect. 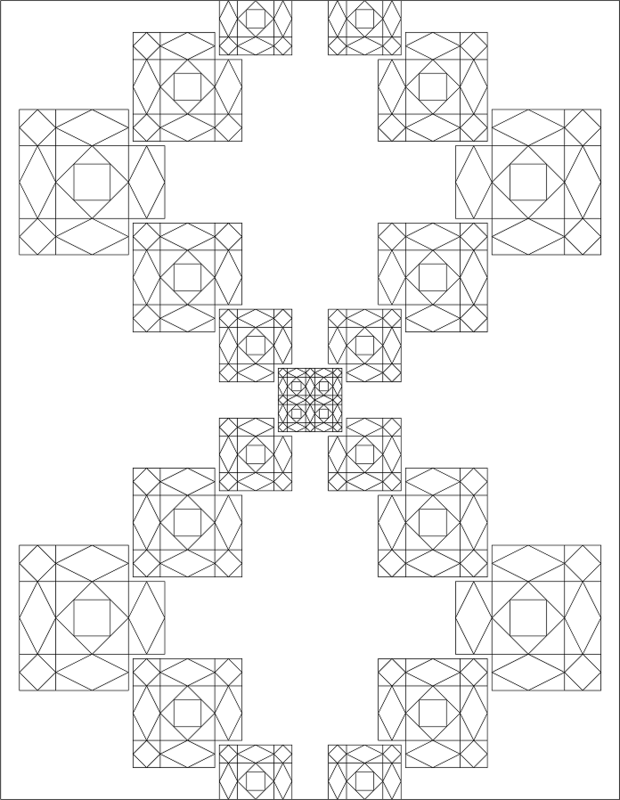 So I stared by studying the Storm at Sea block, and then I created the blocks within my design program of choice, Inkscape. Keeping the rule about playing with scale in mind, I started doodling. Iteration or Version 4 is when it really started to click. Recognizing that part of the charity quilt requirements be that the quilt finish as a twin size quilt, I knew I would need to extend the design a bit differently than I had arranged things in Version 4. Once the group caught up with my whirlwind of activity (I just kept posting / sharing images of designs with them and *thankfully* they all liked what I considered to be the final design), we got down to the next order of business: color. As a group, we discussed the various colors and decided to work with 4 of the 8 colors: Light Gray, PMS 117, PMS 7717, and PMS 280. I sent out a file to everyone with the colors and the next part was the hardest: coming up with the color layout for the design. In the end, we each submitted one colored graphic for voting. Somewhere along the line of making and coloring lots of options, we decided as a group that blue would be the background color after looking at lots of different options (hence all the final submissions have blue as the background; there was a lot of different exploration by all of us in the coloring, though!). We each had 2 votes, and the graphic that got the most votes was our final design. We will be using paper piecing to assemble the Storm at Sea blocks, and Afton is going to help us tremendously by providing templates. We tailored the design to use Michael Miller Cotton Couture Solids in Fog, Lagoon, Gold, and Royal. Renee graciously agreed to be the point person to reach out to see if we could acquire sponsorship for the charity quilt. She put in a lot of work collecting up information and writing very well worded emails explaining the quilt. Renee first contacted Michael Miller, and they are graciously sponsoring the fabric we need to make the charity quilt! We are also thrilled that Aurifil is sponsoring the thread for quilting and The Warm Company is sponsoring the batting. I can’t wait to delve into the piecing! Are you participating in the QuiltCon 2017 Charity Quilt Challenge? I am definitely excited to see the amazing variety of quilts that the challenge yields. Wow Yvonne! You have such an eye and talent for design. I look forward to seeing how this quilt comes together. I’m always so impressed with your projects. Finding out what goes on “behind the scenes” is fascinating. Thank you for sharing with us. Besides a beautiful design, your collaboration with Renee, Afton and Sara is impressive. Congrats on the sponsorships, and good luck in the competition! This quilt will make the recipient smile. This is gorgeous, Yvonne!! What a fun challenge to take on with friends! Paper piecing is definitely a perfect choice for this block! Enjoy and I can’t wait to see the finished quilt in real life! This is so cool Yvonne: Thanks for sharing your process. The quilt is going to be really beautiful. This design is making my “geometry teacher” heart do flip flops! The symmetry, the angles, the colors, the “everything.” I am anxiously waiting to see the finished quilt. great design! I am going to help with 2 quilts! I too signed up as an individual member and got assigned to a group. Then I finally found time to discover (and enjoy) my local modern quilt group and will help with that as well. Are you going to quiltcon 2017? I would have picked the Double Rainbow too…it is intriguing. This will be a wonderful project! Perfect color choices! Double Rainbow is the one I picked. What a striking design, the flow, the illusion of curves. Amazing designing skills you have!! And paper pieced!! Sounds like a great partnership on your stunning design. Will look forward to seeing this finish for sure! Thanks so much for sharing your design and collaborative efforts. The charity challenge quilts get better every year and I’ll look forward to seeing the completed quilt in person! What a great process to have explained. I love the colors in the diagram and can’t wait to see the finished quilt. It’s so great to see how the collaboration of a group of women who are not geographically close turns out something remarkable. What an amazing take on the Storm at Sea block Yvonne! It looks cosmic to me and I think that is perfectly in keeping, given that you all are the Blue Moon Quilters. I’m so impressed! I love your version of Storm at Sea. I enjoyed seeing your transgression to the final layout. I can’t wait to see the finished quilt. Good Afternoon Yvonne! Wow this is an amazing design! Reading your post, I can feel the excitement that you are all feeling. I am glad that you are all having a great time working together to make this. Plus, I can not wait to see more. Thank you for sharing and have a fantastic creative day! What great collaboration and a great quilt design, I can’t wait to see it come together. sounds like it’s been exciting to design, hope you have more fun assembling the quilt! So glad that you were able to collaborate with some fantastic people. The Storm at Sea block has always been a favorite of mine because the illusion of curves. This is going to be incredible once it’s finished. Good luck! I love it when you take the time to show your design process, as it is one of my favorite parts of quilt making and something that I enjoy seeing how other people do! Your final design is awesome and I am sure that the collaboration will be great. I would love to see a post on how you assemble the quilt in the end because all I can see in your sketch is a ton of partial seams!!! Lovely design! It would have been hard to choose the final coloring as I loved them all! You’ll have a lot of fun putting it together, and what a great idea to have a challenge for a charity! A natural fit for you, because you are so generous. This is going to turn out amazing. I loved reading about your design process. What a great collaboration – this has worked so well so far. I loved seeing how different your design looks when the colours are moved around, and it was interesting to see all the initial ‘sketches’ too. I’m really looking forward to seeing this in fabric. Storm at Sea is one of my favourite designs and I love the way you’ve played around with it, so interesting! You have given me a lot of food for thought. I must give the scale variation idea a try myself. Look forward to seeing the end result! Love seeing all the different layouts and color choices for modern version of storm at see. Looking forward to seeing more of this from the Blue Moon Quilters. Not my fav color combo but hey the desing looks really cool! I like that you sharing the whole process with us. It is interesting to see. 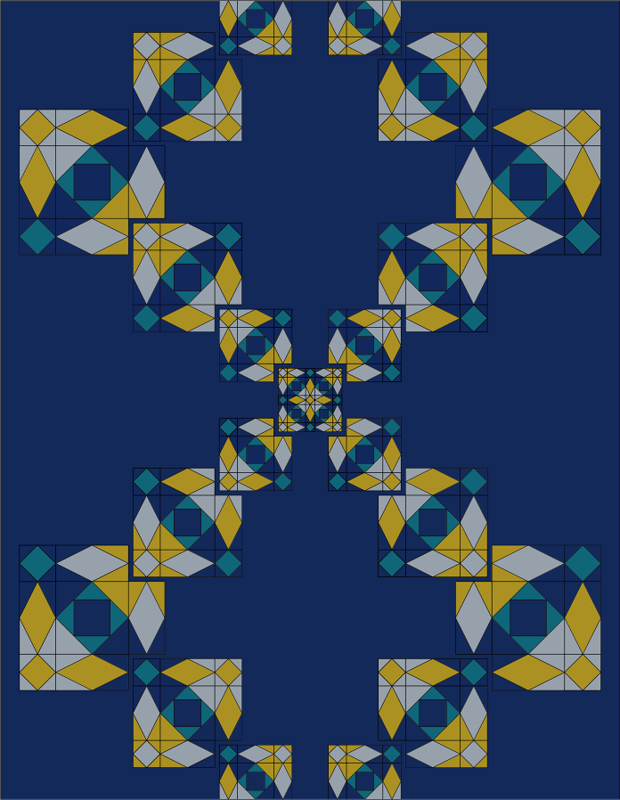 Very interesting design – a bit dizzying as it draws you in – really looking forward to seeing this in quilt form!